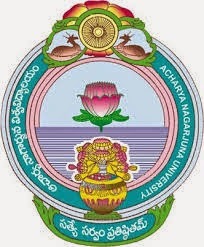 Nagarjuna University degree 1st Year 1st Semester exams, Oct-2015 Fee Notification is released by the university today and here are the detailed notification. Only theory examinations are held in the month of October-2015. The first year 1st & 2nd Semester Practical examinations are held at the end of the second semester. The examinations are held in Selected examinations centers. The candidate need to secure 40% of the marks in internals and 40% of the marks in external examinations to get pass that subject. The internal examination are held in Mid-I & Mid-II and Average of the two Mid's will be given as five marks. The end semester examinations held for 75 marks. All the updates Regarding CBCS system only will available on this site only.